As cooler weather begins to set in, many students are turning on the heater and pulling out their winter blankets. Thursday night, however, some students will be grabbing their sleeping bags and heading to Pocket Park for a sleep out. 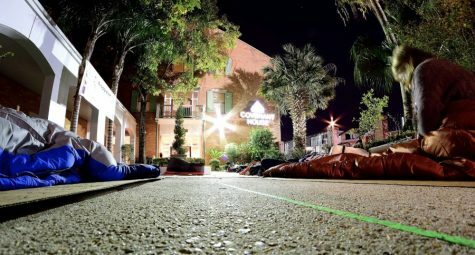 A group of 20 students will participate in a sleep out Thursday night to raise money for the Covenant House New Orleans, which provides shelter and support for homeless and runaway teenagers in the city. Sophomore and sleep out participant Violet Traub-Epstein said she hopes to raise both money and awareness about the issue. “I chose to participate in the sleep out as an act of solidarity with the 4.2 million young people who experience homelessness each year and help the covenant house to provide for them,” Traub-Epstein said. At the time of publication, the 20 students had raised $8,146 out of the current goal of $8,250. “They have far surpassed their original goal and have continued to raise the goal as the donations keep coming!” Palmer Mills, volunteer coordinator of the Covenant House, said. The Covenant House is a human rights activist group that provides shelter to runaway and homeless teenagers. It has locations in 31 cities across six countries and helps about 80,000 young men and women aged aged 16-22 per year. To provide more information about its mission and the sleep out, the Covenant House will host a discussion from 8:30-10 p.m. Thursday night in the Weatherhead Hall lobby. Covenant House staff, including Executive Director of Covenant House Jim Kelly and Mils, will talk about the mission, and clips from their documentary will be shown. “This will be a really informative, engaging part of the night and it is open to everyone,” Traub-Epstein said. The event was coordinated by sophomore Alicia Buenaventura, an intern for the Covenant House. She was also helped by Tulane’s chapter of Habitat for Humanity. “I’m excited for students to see a new perspective on homelessness, and am proud of the funds already raised and love shown toward our homeless community,” President of Tulane Habitat for Humanity Erin Bender said.